Berkshire Hathaway bought 75 million additional Apple shares in the first three months of 2018, CEO Warren Buffett told CNBC on Thursday, signaling the billionaire investor's continuing confidence in Apple. In February last year, Buffett revealed that his holding company held around 133 million shares in Apple prior to the company's record-breaking earnings results on January 31, 2017, worth over $17 billion at the time. Today it holds 240.3 million shares worth $42.5 billion. "If you look at Apple, I think it earns almost twice as much as the second most profitable company in the United States," Buffett told CNBC. 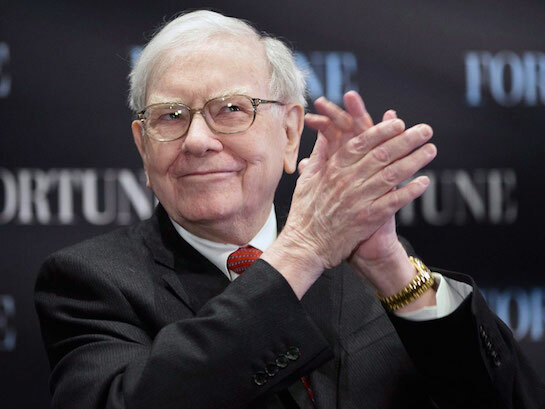 Historically, Buffett has shied away from investing in technology companies, but the business magnate has suggested he sees Apple more as a consumer company. Reuters reports that Berkshire's latest Apple investment serves as a way of reducing the corporate group's $116 billion in cash and equivalents, without having to acquire a whole company. Apple posted revenue of $61.1 billion and net quarterly profit of $13.8 billion in the first quarter of the year, up from revenue of $52.9 billion and net quarterly profit of $11.0 billion in the year-ago quarter. Apple said it will start a new share buyback authorization of $100 billion following the record revenue and profit numbers. It's really odd how some old guy like Warren Buffett understands how Apple is being run and he's not even into tech. I know he was saying that he's not buying Apple stock just for quarterly iPhone sales. He's looking at a longer term picture. Yet, there's always these analysts and investors fretting and crying over how many iPhones are being sold and consider it some sort of financial disaster if Apple comes up a million short in a single quarter. Shouldn't most companies be judged by product sales for a full year and not just quarter to quarter. I realize Apple might not perform like the FANG stocks do when it comes to share gains. Apple doesn't appear to have any double-digit growth in revenue. Maybe those times are gone forever. Still, there's no reason for analysts to be telling people to dump Apple stock and buy FANG stocks. Saying something like that is so stupid. Apple gives out pretty decent dividends. Most companies don't have double-digit revenue growth so it's like analysts are telling investors not to invest in companies that can't provide double-digit revenue growth and that's most of the companies on the planet. For the most part, Buffett seems like a rather smart and conservative investor who buys stock based on a company's fundamentals instead of just quarterly sales. He seems like he's into Apple for the long haul and I hope he is. It will be interesting to see if Apple is able to outlast any of the FANG stocks that Wall Street constantly praises. Lol and at the peak, Carl Icahn held 3 million shares, right? Goes to show how different these investors are. Berkshire buys 75 million, doesn't tell Apple how to run the show. Icahn holds 3 million and every week spouts off about how badly Apple is being operated. This has never been Buffett's style. He's been a buy and hold "value" investor for decades, this is how he made his reputation and his billions. Now, suddenly he's a pumper and dumper? No, probably not. Well said. Apple's P/E ratio is wonderfully low, and the fact it posts gains as it does for a $920 billion company is extraordinary. I think it's undervalued, and the only reason I'm not buying AAPL is because I'm already exposed to the tech sector and don't want to indulge. That has been the secret to Buffet’s success. He buys companies that are doing awesome and then lets the people who got them there keep running them. If a company needed help making decsisons, Buffet wouldn’t take a second look at them.